With its novel, laser-based technology, this early-stage company hopes to displace lumpectomy as the standard of care for eliminating breast tumors after early detection. 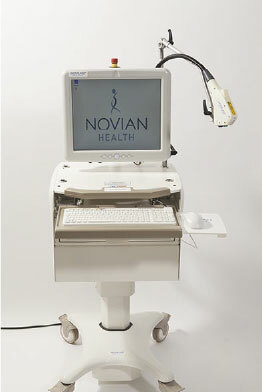 Novian Health develops laser-based, image-guided tumor ablation therapies. Its first product, Novilase, is a minimally invasive system for treating small breast tumors during early disease progression. The system includes two small, disposable probes – one to deliver the laser to the center of the tumor and another to measure the temperature of surrounding tissue – and a mobile console (with proprietary software) to monitor the therapy in real time. The device is FDA 510(k)-cleared for treatment of benign breast tumors (fibroadenomas) and soft tissue ablation and is currently in multicenter clinical trials in the U.S., U.K., and France for the treatment of malignant breast tumors. While early breast cancer screening and diagnosis has become technologically sophisticated over the past decade, the same cannot necessarily be said for early breast cancer treatment. Lumpectomy, the current standard of care for treatment of small breast tumors, is rather conventional in its approach (uses a scalpel to cut the tumor out) and has numerous drawbacks. First of all, it’s invasive, involving a 2” to 3” incision, internal tissue removal, sutured closure, and scarring. It’s time-consuming – the procedure usually takes over an hour to complete – and more than one surgery is often required. It’s expensive, since it must take place in an operating room (OR) under general anesthesia. And, it’s traumatic to the patient, due to its invasive nature, two- to seven-day recovery time, and cosmetic implications. The Novilase system consists of two tiny 14-guage probes (smaller than an average biopsy needle) that are tethered to a mobile cart, which houses a Class IV laser source and a monitor. During the procedure, the laser probe is guided into the middle of the tumor using ultrasound or X-ray guidance. A thermal probe is positioned at an appropriate distance from the laser via a probe guide to accurately measure the temperature of the surrounding tissue. Heat is then transferred from the tip of the laser to the tumor via a saline drip (to improve heat transfer and prevent charring). Once the thermal probe registers that the necessary temperature has been reached – tissue cells die almost instantaneously at 60˚ C and in a matter of minutes at temperatures slightly below that – the Novilase’s proprietary software automatically shuts the system down. (The physician can also stop the process manually). Unlike a lumpectomy, the Novilase procedure can be performed in about 30 minutes, on an outpatient basis, under local anesthesia, and in a procedure room rather than an OR. According to the company, these factors results in an estimated 32 percent reduction in costs compared to lumpectomy, before factoring in any clinical advantages. The probe entry points can be closed with a small bandage rather than stitches, and more importantly, no tissue is removed. “Following the Novilase procedure, the body reabsorbs and remodels the ablated tissue like it would any other dead tissue,” Appelbaum explains. “Lumpectomy can leave a misshapen cavity and scar that can interfere with detection of recurrence. Further, lumpectomy sometimes results in a dimpling in the physical appearance of the breast. If you look at ultrasound images three months after Novilase, the treated area looks almost like normal tissue.” Plus Novilase has been used to remove multiple benign tumors during the same procedure and has proven more effective at eliminating tumors in one pass. Novian Health was founded by Dr. Kambiz Dowlat, a professor of surgery at Rush University Medical Center who introduced stereotactic biopsy to the United States in the 1980s. Dr. Dowlat originally formed the company in 1991 as a research vehicle, but by 2000, he began working on the technology that would eventually become Novilase. The company tapped both those sources of funding – along with institutional capital – in three equity rounds that have raised $20 million. To date, those funds have supported the company from initial product development, through a successful feasibility study, and into a multicenter clinical trial involving 60 patients in the U.S./U.K. and 30 in France, which Appelbaum expects to wrap up in the next few months. Next up is a Series B preferred round of financing that will take place in late 2014/early 2015. Appelbaum hopes those funds will carry Novilase through a second international pivotal trial (enrolling around 200 patients), CE Marking, filing of an FDA premarket approval, and initial reimbursement in Europe. If all goes according to plan, Novilase will hit the European market in in 2016, and the U.S. market a year or so later. Meanwhile, Novian Health will continue to explore new indications for its technology – the company is exploring possibilities in liver cancer and immunotherapy (where thermal ablation could trigger an antitumor immune response). However, Appelbaum says the company’s chief aim is providing breast cancer patients with an alternative to lumpectomy.